For the tenth(!) 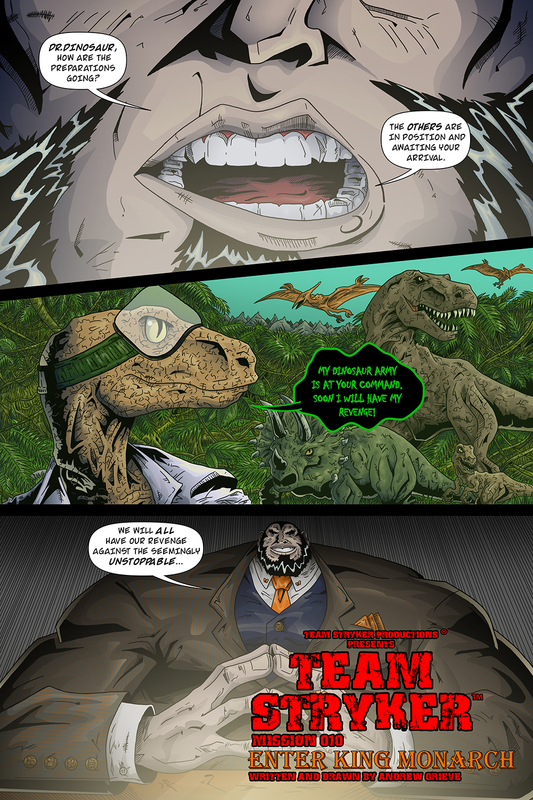 issue of Team Stryker I wanted to make sure I brought back everyone’s favorite velociraptor in a lab coat Dr. Dinosaur. I don’t know if it’s just people’s love of dinosaurs, or the fact that Mission 003 was the first to be done on 11×17 comic board, but Walk in the (Jurassic) Park is many fan’s favorites each year. I’m constantly selling out of Mission 003 when I go to comic expos. I wish I could contribute my drawing/writing skills, but I think it comes down to the fact that people just love dinosaurs. As for the mysterious man in the shadows? You’ll just have to keep reading to find out! Team Stryker will continue to update on Mondays, but be sure to follow me on Facebook, Twitter and Instagram @TSComic.